Activate-G has been specially formulated to combine with the active ingredient of weed killers to improve their uptake into the plant. This is done in two ways, firstly by stopping the pesticide 'locking up' when used in areas of hard water, & secondly by helping the chemical absorb into the plant using its unique 'uptake system'. Using Activate-G stops any loss of active ingredient as it is drawn into the plant rather than sitting on the surface & evaporating or running off. Mixing Activate-G with herbicides such as glyphosate & grassland products has significantly enhanced the speed & effectiveness of the kill. Typically, adding in this product sped up herbicides by 7-10 days & helped reduce the time taken for the herbicide to dry on the leaf by several hours. This can be particularly helpful in times of poor weather conditions. 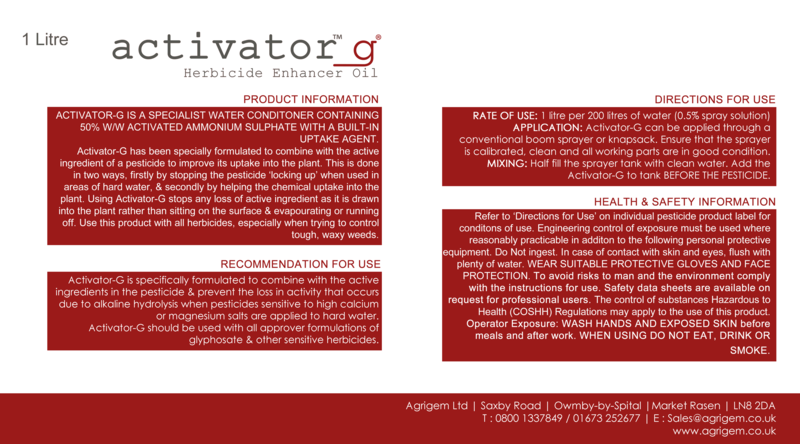 In short, adding Activate-G enhances the effect of herbicides by around 25%. Using Activate-G can be very useful when trying to countrol tough, waxy plants, or when trying to penetrate large, dense foliage.